If you’re looking for a Classifieds WordPress Theme to set up your classifieds of business directories without a blank template, then there are many custom-built WordPress Directory Themes that you can choose from. Classified themes let you monetize portals for all kinds of goods such as cars, motorcycles, property, business portals etc. These themes typically include contact forms, category features for the listings, order forms, integration with major payment gateways and WooCommerce support etc. Modern Classified WordPress Themes template like the one below are also responsive for mobile devices. 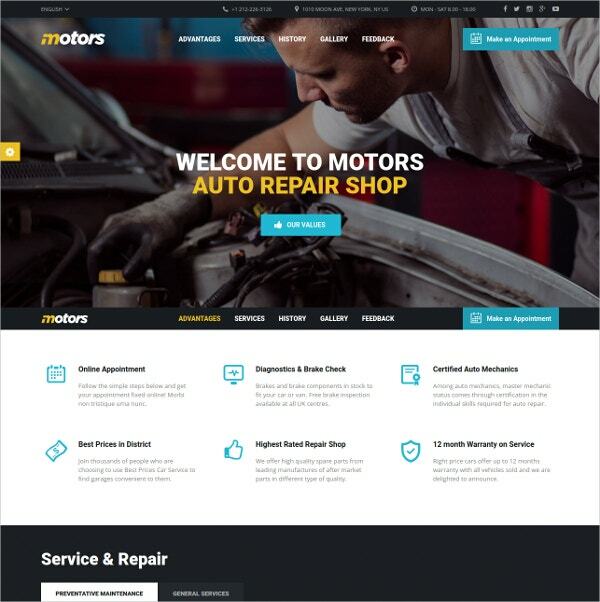 Motors is a theme suitable for classifieds, repair shops and the motor dealership industry, whether the product is boats, cars, motorcycles or other vehicles. Import demo content with a single click and quickly set up a site with customizable search options, inventory list and grid layouts, vehicle info page templates, features compare, calculators, seller layouts etc. It is PayPal integrated and can be customized with the real-time WordPress customizer. 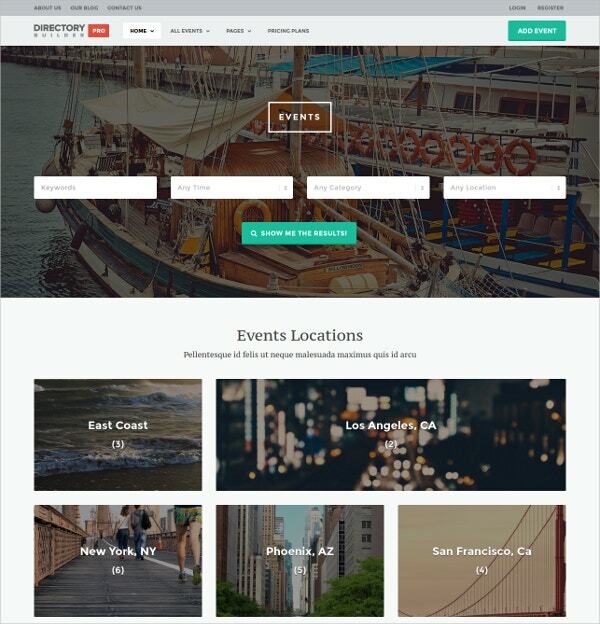 Directory Builder Pro WP Theme is a feature-rich advanced listings theme that can be customized for any kind of industry, such as adding booking systems and work hours for the hospitality industry. Features include popular WP plugins Visual Composer and LayerSlider. It is MailChimp compatible and comes with various forms, custom shortcodes, claim listing form, advertising spaces, OpenTable, etc. 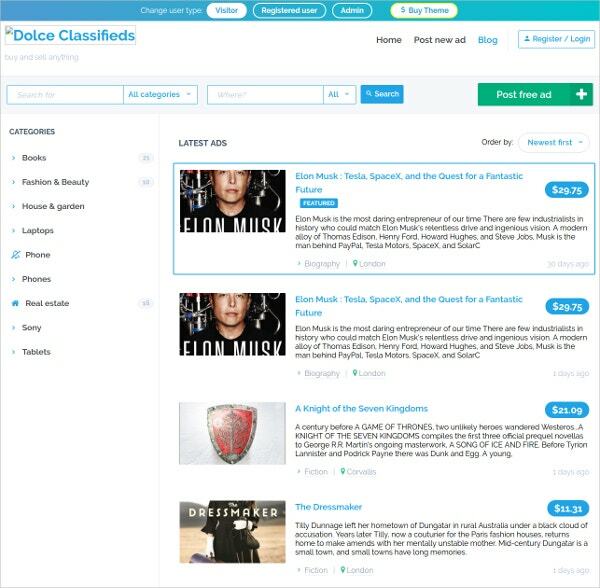 Classiera uses a Redux framework for its classifieds template with over six homepage designs, Font Awesome and Google fonts, demo content and more. It can be used for any kind of business classifieds, job board, etc. It is built with HTML and CSS and comes in a four column layout that you can customize easily with the control panel. 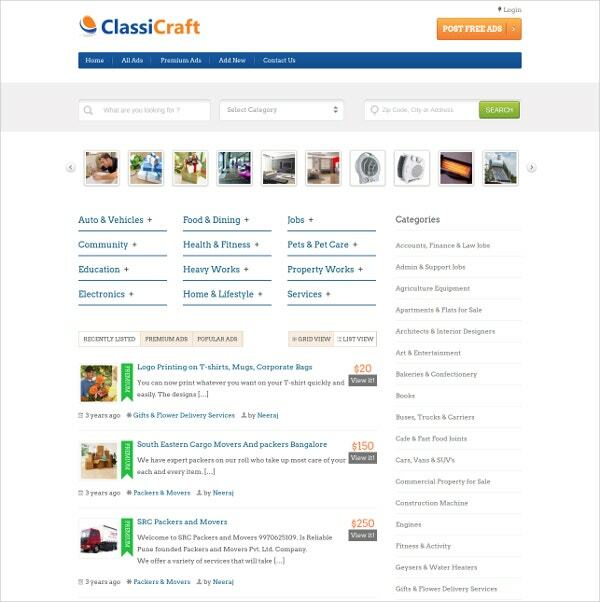 Classicraft is a listing theme for real estate, pet listings, electronics, job boards and other types of directories. It is a light, minimalist theme with bright accents that makes browsing a pleasure. The theme is PayFast and PayPal integrated so that you can collect earnings from ads. Other features include space for the top, recent and most popular ads, category feature, slider for showcasing important info, filter, business logo, widgetized footer with social icons and more. This theme from Dolce Classifieds is a premium and great-looking theme with a clean, spare design. Highlights include a custom private messaging system for customers and sellers, a form builder that lets you create unlimited forms for each category of listings, support for 10 foreign languages including Greek and Russian, PayPal and Stripe support and no need for additional plugins. 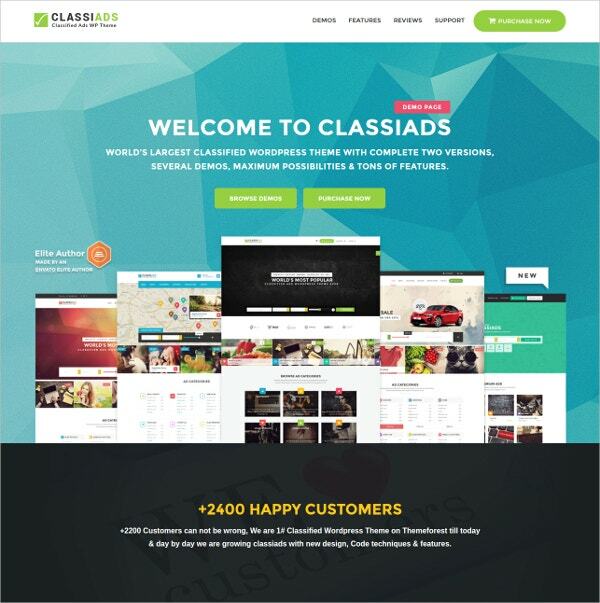 Classiads has had over 2000 sales on Themeforest and it’s designed by an Envato Elite author. It has a modern design with two versions: modern and classic. Features include a drag and drop homepage, Google fonts, demo content in XML format, 5 header styles, a powerful theme panel for customizations etc. It also includes a slider, Google Maps, MailChimp and PayPal integration etc. You can easily install the ClassiPress theme and gain features such as multiple pricing models (that is, category, percentage or fixed pricing for ads), the ability to create custom forms and fields and more. It lets you set up a conditional membership pack. The personalized dashboard to view and manage ads is convenient, as is the auto-complete and suggest search built on AJAX. Classify is a simple and functional theme with features like LayerSlider that transforms well across mobile devices, Google Maps and Geolocation support. It comes with unlimited color support and Font Awesome icons. It is bootstrapped and comes with WooCommerce ad bbPress support. Also included are a working contact form, support for video ads, and the capabilities possibly because of its HTML5 and CSS3 coding. 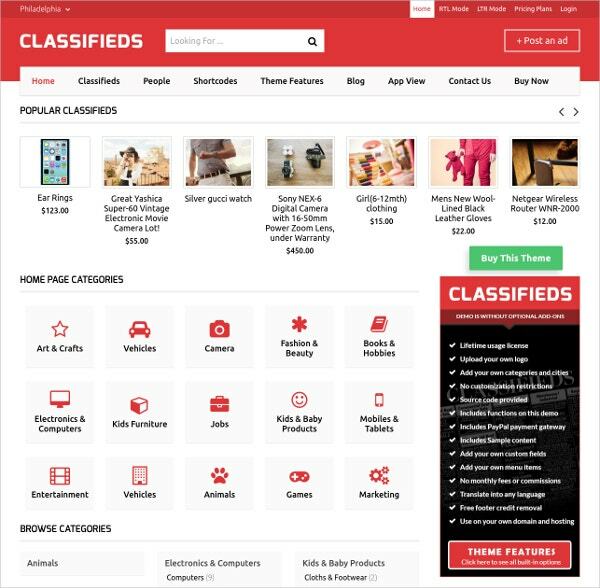 This theme is simply called Classifieds and it has a simple yet effective design. The theme is easy to install and the 1-click demo content download will have a site up in minutes. It includes grid and list category views, premade page templates like User Profile, Detail Page, People Page and Homepage. It also supports a full-screen map and includes a mobile app view that can be activated with one click. 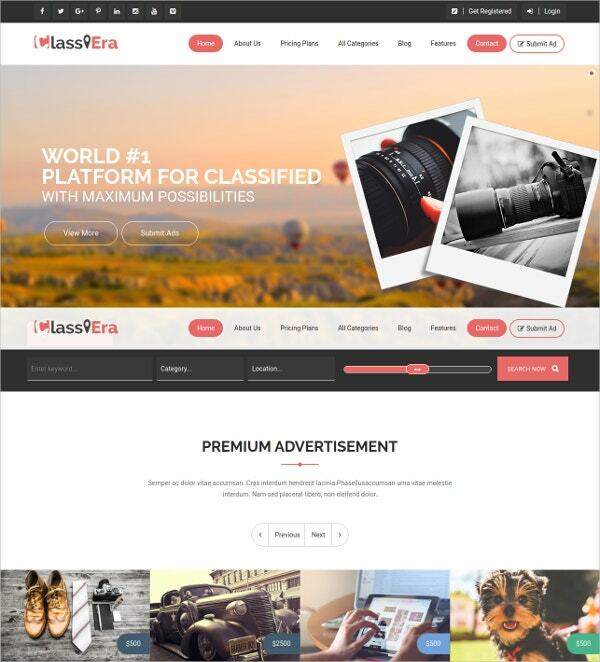 This Classifieds theme is feature-rich and highly customizable. It includes over 50 extra child themes, claim listing, support for popular WordPress plugins, filtering of content and maps and multi-language support. The theme supports PayPal and over 20 other payment gateways. It also supports free and paid listings, has a user account area and also lets you add visitor ratings and comments. 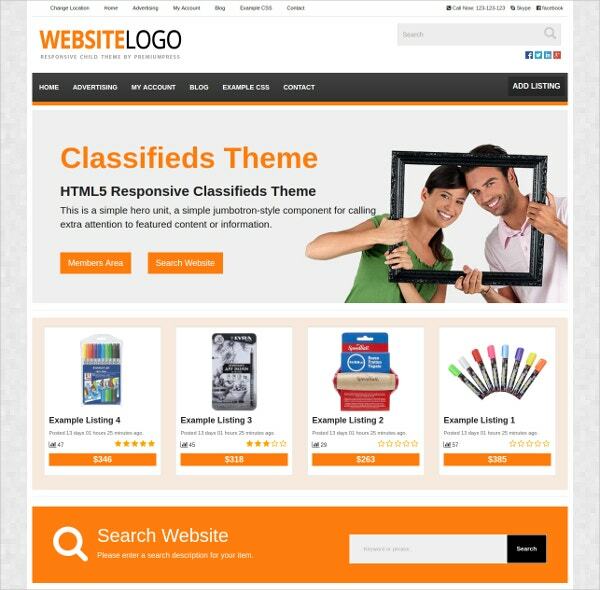 The above themes will let you get started on a classifieds website quickly. In addition, you can quickly redesign the template for your own needs. 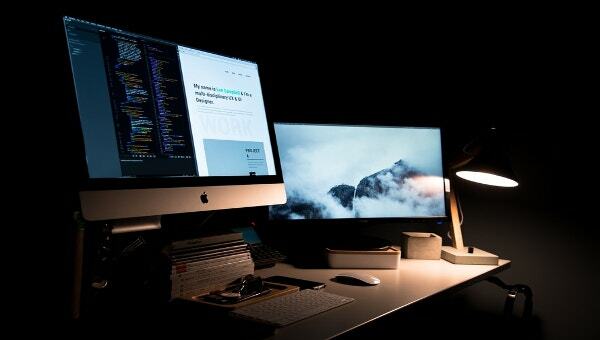 If what you’re looking for is WordPress eCommerce Themes that you can use to sell products or services, many of the classified themes above can be customized to suit your needs.